Resurfacing work on Waiānuenue Avenue will start from Kamehameha Avenue intersection and proceed to Ka‘iulani Street beginning on Monday, Nov. 13, 2017. 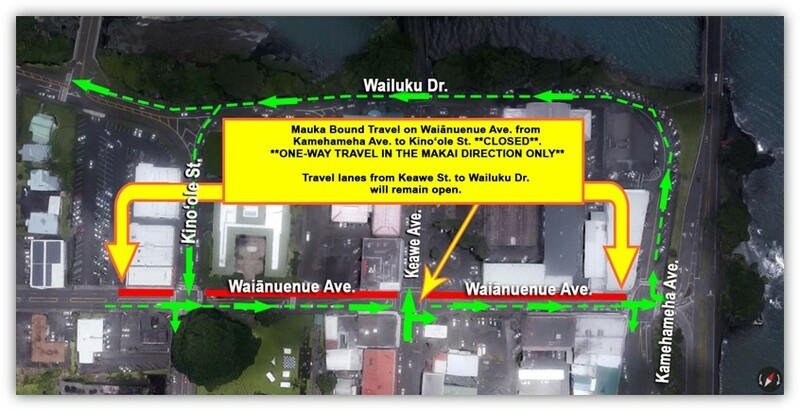 Motorists heading in the mauka direction from Kamehameha Avenue to Kino‘ole Street will be redirected to Wailuku Drive as a one-way travel pattern on Waiānuenue Avenue in the makai direction will be in effect. Motorists are advised to drive with caution as emergency response vehicles will be allowed to travel in both directions through the work zone at all times. Travel lanes from Keawe Street to Wailuku Drive will remain open. The one-way travel restriction will be in effect from 8:30 a.m. to 5 p.m., Monday through Friday, and travel in both directions will be restored at the end of the workday. Normal traffic patterns in this area will be restored once the project has proceeded past the Kino‘ Street and Waiānuenue Avenue. intersection. Special off-duty police officers will be in the area to facilitate traffic movement during the lane closures and lane shifts. Motorists are advised to expect delays and are encouraged to use alternate routes. Questions or concerns, contact Information and Education Specialist Barett Otani at (808) 961-8787.